Eastern National is proud to announce the winners of its annual awards for 2016. 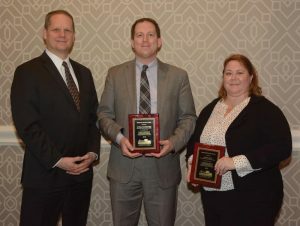 The awards program was designed to acknowledge outstanding individual achievements and contributions that have had a positive impact on an EN operation or an individual park, thus furthering and promoting EN’s unique relationship with its partners. 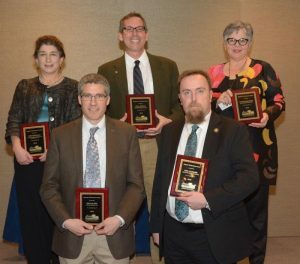 Congratulations to the following 2016 awardees. Visit Eastern National’s Facebook page to view additional photos of the award winners. 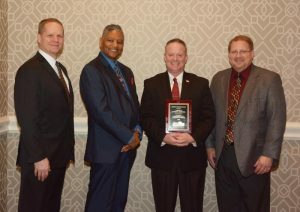 Pictured left to right: Kevin Kissling, Eastern National president and CEO; Calvin Wilson, Families of Flight 93 board member and family member of Flight 93 hero, LeRoy W. Homer, Jr.; Stephen Clark, superintendent of the National Parks of Western Pennsylvania; and David Wagner, EN Mid-Atlantic regional manager. Stephen accepted the Charles S. Marshall Unit Award on behalf of Flight 93 N MEM. The Charles S. Marshall Unit Award was presented to Flight 93 National Memorial for exceptional teamwork. EN will donate $2,500 to the park’s interpretive program. The Unit Award recognizes the most outstanding agency that has achieved noteworthy teamwork in promoting and aiding the historical, scientific, educational, interpretive, and operational activities of EN partners through EN agency operation. Teamwork is evidenced through agency growth, visitor service, product development, partner relations, and administration. 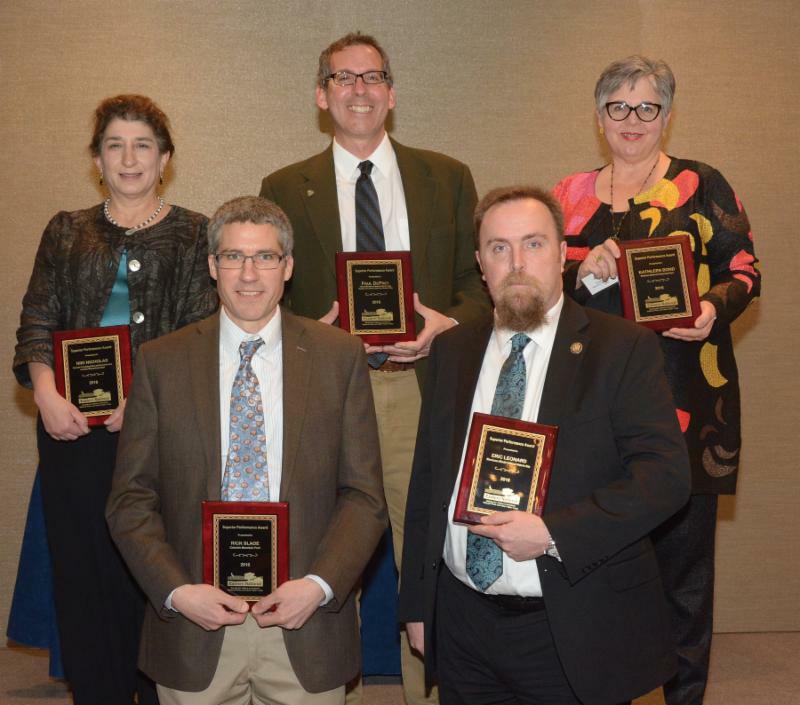 Superior Performance Award winners, front row (left to right): Rick Slade, superintendent of Catoctin Mountain Park, and Eric Leonard, superintendent of Minuteman Missile NHS, and back row (left to right): Niki Nicholas, superintendent of Big South Fork NRRA and Obed WSR; Paul DePrey, superintendent of Salem Maritime NHS and Saugus Iron Works NHS; and Kathleen Bond, superintendent of Natchez NHP. * Kathleen Bond, superintendent of Natchez NHP, for her instrumental support in the collaborative effort between the park, EN, and the City of Natchez for the new Natchez Shop. * Paul DePrey, superintendent of Salem Maritime NHS and Saugus Iron Works NHS, for his leadership and support in the planning and realization of the new EN Waite & Peirce: Authentic and Exotic Goods store at Salem Maritime NHS. * Eric Leonard, superintendent of Minuteman Missile NHS, for his loyal support of EN and his responsiveness in approving many new items that have driven sales to an increase of 73.4 percent over the prior fiscal year. * Niki Nicholas, superintendent of Big South Fork NRRA and Obed WSR, for taking a personal interest in the EN stores at her parks, regularly making recommendations for new items, and always being ready and willing to assist with anything that is needed. * Rick Slade, superintendent of Catoctin Mountain Park, for his instrumental support at two different parks where he served as superintendent in 2016 – Monocacy NB and Catoctin Mountain Park – resulting in increased sales at both locations. The Herbert E. Kahler Award recognizes the EN partner judged to have cooperatively managed the most efficient and innovative agency. The winner of this award is selected from among the Superior Performance Award winners. The Kahler Award was presented to Kathleen Bond, superintendent of Natchez NHP. 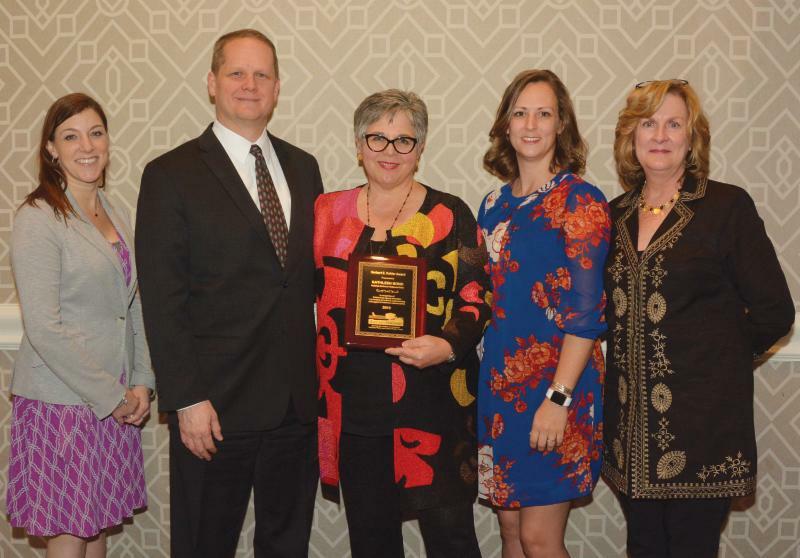 Pictured left to right: Megan Cartwright, EN director of retail; Kevin Kissling, EN president and CEO; Herbert E. Kahler Award-winner Kathleen Bond, superintendent of Natchez NHP; Helena Adcock, EN Southern regional manager; and Karen Peters, EN merchandising and store design manager. Dedicated Service Awards were presented to Alexa Viets, chief of the National Park Service Centennial Office, and Donald Leadbetter, NPS Centennial partnership coordinator, for their strong support and assistance during the NPS Centennial year. EN President and CEO Kevin Kissling (left) presents Dedicated Service Awards to Donald Leadbetter and Alexa Viets. The Customer Service Award was presented to Cape Hatteras National Seashore and Franklin Delano Roosevelt Memorial. This award recognizes the EN store staff with the highest average score in EN’s secret shopper program. The program evaluates the overall store appearance, product presentation, and staff professionalism. These two park stores scored a tie in 2016. * Sherri Anderson, site manager at Grand Portage NM, for her innovation in merchandising the store, resulting in record sales. * Stephen Drain, manager of the America’s National Parks Warehouse, for his leadership of the warehouse team, resulting in a well-run, organized operation and a record-breaking increase in sales. * Joanne Gallagher, web maintenance and marketing support analyst at Eastern National Headquarters, for her dedication, creativity, and dependability in carrying out her job duties and being instrumental in the significant growth of EN’s online sales channels. * Chastity Halfhill, assistant unit manager at Flight 93 N MEM, for her excellence in fostering EN’s partnership with the park and exemplary teamwork and customer service skills, resulting in multiple successes during the store’s first full year of operations. * Tyshon Kelton, unit manager at Martin Luther King, Jr. Memorial, for his strong leadership of the staff and oversight of new hire recruitment and training for all stores in EN’s National Capital Region. * Greg Kraycirik, unit manager at Flight 93 N MEM, for his motivation, leadership, and initiative in inspiring his staff to achieve and surpass team goals, resulting in an 86 percent increase in sales for 2016. * Karen O’Neal, site manager at Natchez NHP, for her hard work ensuring that the renovation and opening of the new Natchez Shop was a success. * Angel Rosa, assistant unit manager at El Yunque National Forest, for his initiative, dedication, and professionalism in helping to get an EN store up and running efficiently, which resulted in a significant increase in sales. * Karen Searle, Blue Ridge regional manager, for going above and beyond her regular duties to lead an EN apparel program initiative and developing recommendations for the program’s future. * Heidi White, chief financial officer at Eastern National Headquarters, for going above and beyond her regular duties to assist with all lodging reservations and payments for a “Freedom Ranger” interpretive program for National Mall and Memorial Parks.